I spent two years living in a small town at the bottom of Shizuoka Prefecture's Izu Peninsula. It was idyllic: prices were cheap, everyone on the street said hello, and the beach was a five-minute bike ride away. But the local creepy-crawlies took some getting used to, and more than a few of them found their way into my apartment. Adanson's House Jumpers are known in Japan as Adanson haetori, where haetori is the Japanese word for jumping spider—literally, "fly-catcher." Cute little haetori-gumo are Japan's standard house spider, and I've found them in my apartment everywhere I've lived, be it city or countryside. Adanson haetori have small, brown or black bodies that grow to less than a centimeter (0.4 in) in size. They're generally harmless, but their tendency to leap several times their body length can be a little off-putting if you're used to spiders traveling in a linear fashion. And if you're like me and don't like killing them, those omnidirectional jumps can make things complicated as you try to guide them to the door. The drone of the semi, or cicada, is the iconic sound of Japanese summer. They even have a different kind of buzz depending on the species. While you may hear them everywhere—even in Tokyo if there's so much as a single tree nearby—they're generally hard to spot unless you're specifically on the lookout for them. The first time I saw one, I'd climbed to the top of a wooded hill to practice with my bokuto (wooden sword) shortly after arriving in Japan. After a few swings, I noticed an insect the size of a hamster on the ground beside me. Aside from sitting there being unnervingly large, it didn't do anything at all. The largest semi species in Japan can grow up to 7 centimeters (2.8 in) in length—comparable to the Malaysian emperor cicada, the largest species in world. While some species can incubate for years, once they take their adult form, they're only believed to live for about a month. In fact, despite their size, you're most likely to spot one right as it dies, going through its slow final twitches on your doorstep or balcony. Kogane-gumo, literally "golden spiders," are known variously as black and yellow garden spiders, wasp spiders, St. Andrew's Cross spiders and X spiders. You'll usually see them hanging from their webs with their legs in an X formation, waiting for prey in a tree or bush. Their bodies can get up to about 2 centimeters (0.8 in) in length. Joro-gumo, or joro spiders, might seem quite similar at first glance. However, joro-gumo grow larger (their bulbous bodies can be up to about 3 centimeters/1.2 in), they weave more expansive webs, and they tend to dangle from spindly, more evenly distributed legs. You'll find a massive joro-gumo web under pretty much every overhanging roof in the Japanese countryside. In folklore, joro-gumo were considered legendary creatures that could change into a beautiful woman to ensnare human prey. The most wonderful thing about both of these spiders is that they live almost exclusively outdoors; I've never seen one inside. The only problem is that their gossamer webs can be hard to spot if you're hiking. I once walked face-first into such a web on a lonely trail, leaving me with with a sticky mass across my cheeks and a very pressing question about where the spider had gone. I now hike with a long stick in hand, bobbing it from side to side in front of me as I go. Ashidaka-gumo literally means "tall-legged spider." As you might expect, these spiders don't spin webs, but rather use their long legs to chase down their prey, which can include cockroaches and cicadas. They can grow up to a legspan of 30 centimeters (about 1 ft), but the really big ones are pretty rare. The first time I spotted one of these, it was about half the size of my hand, and it ran straight into my closet. After madly emptying all the contents and still failing to find my eight-legged guest, I closed the closet door on him and gave up for the night. About two days later, I decided it was time to both deal with the spider and give my closet a good cleaning. My cleaning materials were under my sink. And as I opened the cupboard doors, the spider flew straight out at me. Not only are ashidaka-gumo big, they are surprisingly fast. This one skittered across my wall and floor like it was a facehugger auditioning for Cirque du Soleil. I had the wherewithal to get a broom and frantically guide it to my landing, where it immediately clambered into my shoe. After a moment of cost-benefit analysis, I decided the shoe could go. I opened the door and tossed my shoe outside. A moment later, the spider climbed out, I got my shoe back, and we amicably parted ways. The next time I met one of these, I was setting up for Halloween in the group hall at one of the elementary schools where I taught. As I shifted a wooden box to place a big rubber spider on top, a real spider about the same size skittered out from behind it. In my final indoors encounter, I was playing video games at night while lounging on the tatami mats in my living room. All was quiet until, to my right, I heard what sounded like fingers drumming on the straw mats. Except it wasn't fingers—it was the sound of the spider's footsteps. That's how big it was. After ushering my heavy-footed friend outside, the next enemy in my game was a bunch of eerily realistic spiders. I nearly kicked over my coffee table. Cockroaches, or gokiburi, are plentiful both in cities and in the countryside in Japan. The largest species can get up to about 4.5 centimeters (1.8 in) in length, but I swear I've seen bigger. Just how many of these guys you meet will largely be a function of the age and cleanliness of your lodgings: The older and messier your apartment, the more likely you are to get a cockroach. When I lived in a shoddy building made in the '60s or '70s, I would spot one weekly. When I found a huge one climbing out of my cutlery drawer, I decided it was time to find a better apartment. If you haven't experienced cockroaches before, they have a seldom-revealed secret power: they can fly. They are also remarkably hard to kill. I thought I'd done one in with a paper towel only to discover that I'd simply made it angry. Tripling in speed, it buzzed on half-broken wings across the apartment floor while I overturned rugs and sofas like a Tremors worm until I could deliver the finishing blow with a crunchy twist. One typical way to deal with cockroaches is with a gokiburi hoi-hoi, a kind of sticky house you can place under your sink and fridge. You can also try cockroach baits like Black Cap and Combat, which contain slow-working poisons that little roaches will bring back to wipe out their entire colonies. 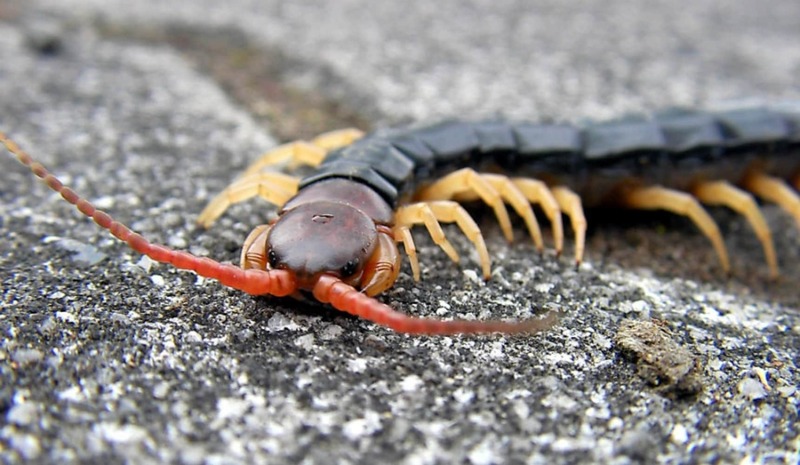 Mukade are giant centipedes with bites that are venomous enough to put you in the hospital—or at least require a trip to the pharmacist. Typically appearing with yellow-orange legs and a red-black body, they can grow up to 38 centimeters (15 in) in length. There are a few variants on the kanji, but my favorite is 百足, which is literally "100 legs." Nobody had warned me about mukade before I moved to the countryside. I first learned what they were when I spotted a fat one at least 20 centimeters (8 in) long on my landing, looking big enough to throw my shoes at me. It slithered around my footwear before ominously disappearing somewhere behind my shoe box. I used a broom to insert a wad of paper into the hole into which I presumed it had crawled, and thereafter prayed that it would never try to return. Now, as someone with terrible eyesight, I generally step out of the shower mostly blind. And some days later, after drying off one morning, I noticed a large black streak on my towel. "Oh, heck," I thought. "That looks like grease. It's never coming out." Wondering how on earth I got grease on my towel, I squinted a little, and that streak started to look strangely familiar. I spent the next few seconds naked and screaming. After acquiring some nominal clothing and a substantial broom, I chased my slinky friend into a gap between the wall and the door frame, then back out to my landing and finally outside, where I introduced him to the bottom of my shoe. When I got home that afternoon, I was still unnerved enough that I needed to make sure his remains were still exactly where I'd left them. Upon hearing the story, my friendly neighbors advised killing mukade with boiling water—though I questioned who had this useful tool on hand at all times. More pragmatically, they recommended a cat, which will apparently pick off mukade like a roving bug zapper. I had seen a handful of what I thought to be "large" ashidaka-gumo indoors. Then one day while locking my door, I noticed three big sticks poking out from under the lid of my wall-mounted mailbox. Then I noticed that the sticks had hair. After finding an appropriately lengthy stick of my own, I lifted up the lid to uncover a very stealthy-looking spider with one-inch body segments and three-inch legs that was so big I could literally see it breathing. Stretched out as it was, its legs couldn't even fit under the lid. I think it was waiting for the mailman. I quietly ushered it on its way with my stick, and from then on, I would inspect both my mailbox and my towel from all angles before even thinking about getting close to either of them. In Japan since 2001, I'm a former ALT trainer who's lived in Shizuoka, Saitama and Tokyo, and visited 34 of Japan's 47 prefectures (13 to go!). When I can get out from behind the editorial desk, I take photos, do bits of theater and practice German longsword.